I changed my mind and decided I would build a buggy instead of the Wag. The Wag continues to wait for it's next build. I ordered up a GoatBuilt JHF chassis to hopefully speed this up. I bought my Wagoneer in 1997. It was my first 4x4 and I bought it so that me and my friends could go camping and have room for our gear since we all drove econoboxes. That fall I ended up moving to Germany for 18 months and it went into storage. When I got back I rebuilt the AMC 360 with the help of a friend, and we did enough maintenance on the rest to get it on the road. Over the next few years it got a 4" lift and went from 31s and then 35s when I put a 3" body lift. We did some wheeling with it and eventually I put it on 33 Stampers from my old Wrangler. In around 2005 it was parked due to lack of time and using any spare time on my Wrangler. A few years later we stole the drive train for the TREC Wagoneer, and it has sat since. Over the summer I got out of racing, bought a RZR and drug this back in the shop. I'm thinking I want to get it back on the road and trails. Last edited by JohnnyJ; April 2nd, 2018 at 04:15 PM. So here's a picture of it back in 2000. Engine was rebuilt and had Projection 4Di on it. The axles had 4.10s installed with a Detroit Locker in back and QuadraTrac had been rebuilt. 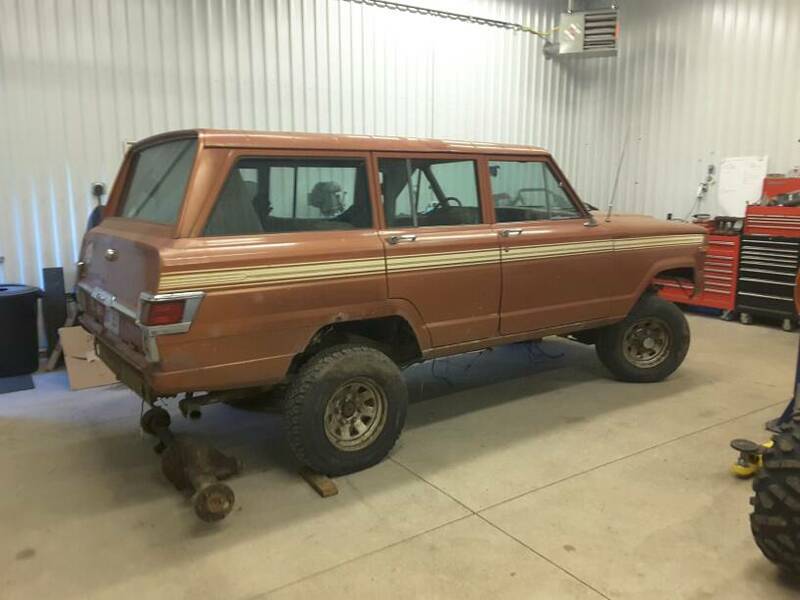 The Wagoneer has no drive train at this time since I sold off the AMC 360/TH400/QuadraTrac when we scrapped the TREC Wag. The 3" body lift and 4" lift springs are on it, but I don't want to use either. Plans for now are Michigan type wheeling, something I can take my wife and kids with me. It won't be a dedicated rock crawler, but a highway capable, trail machine that can get through (small) rocks, snow, mud, whatever. Think Drummond Island, Snofari, blue trails at R&V, Silver Lake, etc. What are your thoughts? Am I going to be blowing up axles and transfer cases with a Wag with 5.3 on 37s? Last edited by JohnnyJ; November 5th, 2016 at 01:08 PM. That thing is awesome. I believe you know what will happen to Dana 44's on something that heavy with 37's and 300+ hp. 05+ super duty 60's are stupid cheap and would likely live fine stock and should help it drive nice. Yeah, I think I know you're right. Just making sure I haven't been living in the 60s 60s 60s world too long. But looking at axle shafts, they are tiny. If I do upgrade axles, my thought is to build them to around "Wide Track" width to keep it looking Full Size Jeep-ish. Might need to adjust depending on wheel choice as many 17" wheels have more backspace than 15s. 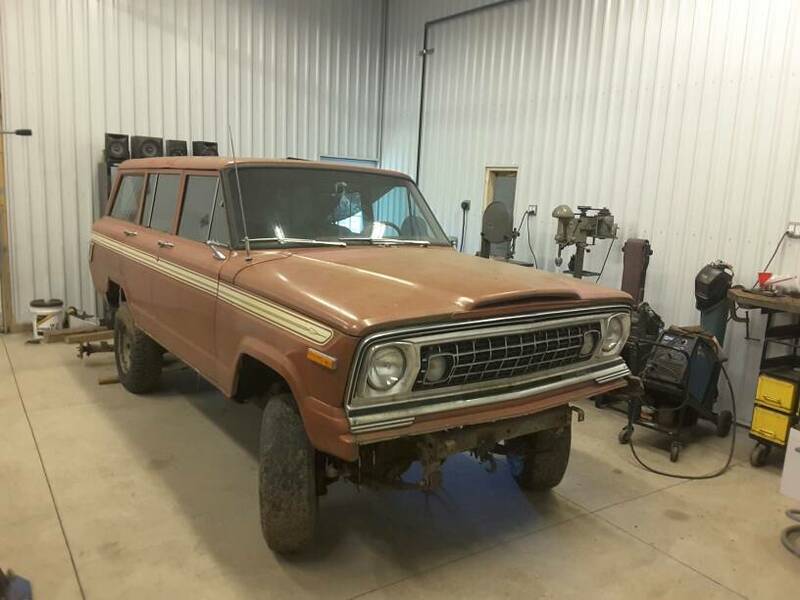 '76-80 Cherokee Chief 2 dr. frnt-65.4" rr-62.3"
Maybe I need to start looking for the super duty, and thinking about chopping down the rear. I had a semi-float 60 in the back of my TJ for a long time and it held up well. I think that would be the route I'd go if I narrow the f250 axle. Super duty will have a sterling in the rear which is what is in the rear of my rig. 35 spline shafts, 10.5" ring gear, and tremendous clearance / shape.....it easily slides over stuff that hangs up 14 bolt rigs....even ones with bigger tires and full shave kits. Car-part.com shows numerous fronts near you in the 300$ range for complete axle. If you are wheeling it, Dana 44's ain't gonna hack it. But if you are just doing a Restomod it will be fine, as you know the body will be trashed to, if you try to wheel it. Shave 4" on passenger side, drop in a dodge/Chevy shaft. 67.5" wms, add some deep wheels and boom. Frdtrkmnrich has some axles for sale. I'm excited to see your build. Always like these old jeeps and the old pickups to (think tremors) lol. Interested to see where this goes. I've been looking at a couple waggys. Same. You know the drill. Do it part way and then build it bigger. Or just go bigger now. I'd link it with tons, keep it on 35-37s, GM 6.0L and call it good. Thanks for the comments. I'm chewing on it now, and working on the game plan. Lots of stuff to go and find. If you are linking it, you may as well go with a Super Duty front end, and whatever rear you choose. 37's will make a nice driveable rig that is big enough for everything you want to do. For a drivable wheeler, the chaincase you get with the donor engine/trans will be fine and have the drivers drop to match the SD front end. Keep the 300 under the bench in case you find some great desire to do front digs later on. If you were sticking with leaves, my suggestions would probably be different. A 60 probably isn't "needed", but you'll be money ahead with a SD 60. The other "good" option is a D44HD with RCV's. You'll have the same initial buy in price, but only need to buy one inner shaft to shorten the SD 60, vs a full set of RCV's and hubs. For a drivable cruiser, the simpler U-joint shafts will be easier to maintain. I found a 2005 Dana 60 through car-part and went to pick it up this morning. Sadly they had mis-tagged the axle. Will have to keep looking. I've been keeping an eye out for a reasonable engine/trans/t-case deal. Interested to watch this build.